Carmen Schentrup was one week away from celebrating her 17th birthday when she was killed in last year's mass shooting at Marjory Stoneman Douglas High School in Parkland, Fla.
A talented musician and driven student, Carmen had dreams of becoming a medical researcher and finding a cure for the neurodegenerative disease ALS. Now, her parents, Philip and April, wear teal bracelets printed with her name and the dates that mark her short life: 2/21/2001-2/14/2018. Carmen was one of 17 students and staff killed in that Valentine's Day shooting, and over the past year, the Schentrups have formed a tight bond with the other Parkland victims' families. They have become vocal advocates for gun violence prevention measures they hope will prevent another tragedy like theirs. And, as they explain during my visit, they want to share their "hard story" in hopes it will spark some positive change. The Schentrups' activism is overlaid with the daily struggles of just getting through another day without their daughter. Reminders of Carmen are prominent throughout their home: here, a photo of her striking a sassy pose in her homecoming dress. There, a photo of her in the graduation cap and gown she would never get to wear. A portrait of Carmen, given to the family by a Parkland artist, hangs in the Schentrups' living room, not far from the metal urn that holds her ashes. The urn is blue: Carmen's favorite color. Several months ago, April Schentrup kept that urn close by, nestled at her feet, as she flew across the country to the family's new home. The Schentrups have traded the palm trees of southern Florida for snowy mountain views outside Seattle. They moved mostly for Philip's job; he works for a tech company based here. But there is more to it than that. Fourteen-year-old Evelyn Schentrup — who shares her older sister's soulful eyes and glossy dark hair — says that even though she objected to the move and hated leaving her Parkland friends behind, she could tell that her parents needed a fresh start. "I think it was just hard for them being around so many reminders of her," she says. "They needed to be away from all the problems and the stress behind everything." 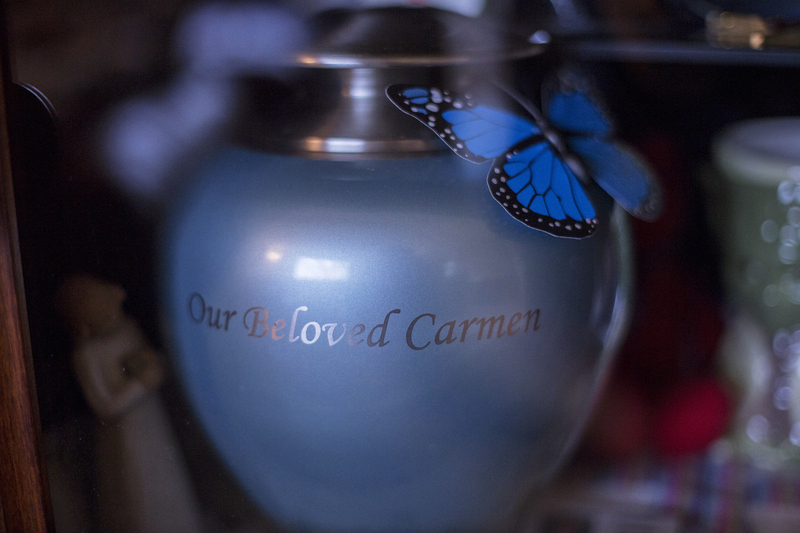 The blue urn holding Carmen's ashes rests with photos and drawings in a glass cabinet in the family's living room. When I visit the family at their new home, Evelyn is logging in for an orientation session with her new online high school. The family opted for online schooling after Evelyn had a couple of panic attacks at her new high school in Washington. "I guess it was just too much change for me," she says, recalling her first panic attack: "I just started crying out of nowhere, and so I went to the bathroom to wipe off my tears, you know, fix my makeup, like a teenager would do. And then I couldn't stop crying. It was just like a river of tears down my face." Her mother remembers, "She called me just saying, 'I can't breathe. I just can't be here.' "
April Schentrup can imagine what that feels like. At times, she says, staying in Parkland felt "suffocating." For example, there was the implicit pressure to be "Parkland Strong." "So you put on this facade that you're OK, you're strong, you're going to get through this, you're a fighter," she says. "And some days, you know, it's true. You do feel like that. And other days it's a lot harder." What made the hard days even worse was learning about all of the things that went wrong leading up to the shooting. The Schentrups learned about warnings made to the FBI's tip line weeks and months before, alerting the agency to specific threats the shooter had made; the FBI has admitted those tips fell through the cracks. They learned about the long chain of security failures at the high school, including warnings that were ignored, gates that were left unlocked, and a long delay in calling a "Code Red" alert once the shooting began. And they learned about the deeply flawed response by law enforcement officers as they responded to the scene. The more the Schentrups learned, the angrier they got. "Lots of people knew this person was troubled. He signaled his intent for years," Philip says, referring to the shooter. "The only thing more he could have done to signal his intent was to buy a billboard on [I-]95 and put a billboard up there, because he was telling people all the time that he wanted to go do bad things. People were taking this information and giving it to the people who were supposed to do something with it. All of them were failing. ... It was just failure after failure after failure." "This happened 19 years later after Columbine, five years later after Sandy Hook," April adds. "But schools aren't taking it seriously. It just seems like it's a problem that can't be ignored anymore." Green sticky notes mark pages of photos from Carmen's childhood that April selected to use during the funeral. Before they moved west, April, who was then an elementary school principal, was given a newly created leadership job: director of school safety and security for the entire Broward County district. It sounded promising, like a way to make real change. But she quickly grew disillusioned. "It didn't feel like it was a real job," she says. "It felt like, here's this mom who's grieving or vocal about all these issues, and let's just give her a job and make it seem to the public like they're doing a good thing. But I wasn't really able to do what I thought I should be doing, in a job that deals with something important like campus safety and security." Asked for comment, Broward County schools spokeswoman Nadine Drew replied that April Schentrup's appointment "was intended to be short-term ... to provide a resource to focus on safety and security issues while waiting for staffing recommendations from Safe Havens." That is the campus security firm hired by the district to assess safety at Broward schools. The Schentrups now focus on their activism. They are part of the advocacy group Stand With Parkland, started by the victims' families, which is pushing for changes nationwide: tougher school safety measures, better mental health screening and tighter gun laws. "There's a lot of people who just want to argue the extremes: [Either the] gun was the issue or mental health was the issue," Philip says. "It isn't an either/or. It's all of the above. And so, we're gonna keep advocating for the reasonable middle ground that most Americans can agree on to go get things done. If we choose to wait, there will just be more parents like us. And there shouldn't be more parents like us." The Schentrups' children are involved, too. Last summer, their son Robert, who is in college, joined Evelyn on the Road to Change bus tour, registering new voters and promoting gun violence prevention. "It's almost a compulsion," Philip says, of his and April's activism. "It's something we feel we have to do not only for Carmen, but for Robert and Evelyn. We want to see them grow up to be happy and healthy." "Carmen never got that," he adds quietly. "But we hope for them." April finds that now — in a new city, on a different coast, meeting new people — the simplest questions can be the hardest to answer. Questions like, how many kids do you have? How old are they? "You know, you could say 'Carmen's forever 16.' But when I said it, it didn't sound right," April says. "I think I even tried 'I have one in college, and one here with me, and my other one is in heaven,' " she continues, through tears. "But again, it just didn't feel right. So I don't know. Still trying. I feel like if I don't mention her it's just wrong, though." Evelyn and April sit below a portrait of Carmen. The painting, acrylic on canvas, is by Parkland artist Nava Lundy, who created portraits of all 17 Parkland victims and gave them to the families. "I just felt this urgency," Lundy says. "I felt like I had to do something to help the families in whatever way I could." The Schentrups also contend with this: the troubling sense that their sharp, individual loss has been swallowed up, overtaken by the post-Parkland movement. "But I wonder," she says, her voice catching, "do they know the people that died? Do they know their names? And although I'm very thankful for March for Our Lives 'cause they spoke when we couldn't speak, and I admire them and what they've done ... I also want to make sure that Carmen's not forgotten. That the people that we lost are not forgotten." This Thursday, one year after the shooting, the Schentrups will be at their new home, outside Seattle. The family has no special plans that day. Just staying close. "Getting through the day," Philip says. Philip talks with Evelyn before leaving for work. The family moved mostly for Philip's job; he works for a tech company based in the Pacific Northwest. "It'll never be Valentine's Day for us," April adds. "Every day I cry. So I'm sure it'll involve that. And — hugging Evelyn a little bit harder. But Feb. 14, we're just gonna ... be together." Before I leave, I ask the Schentrups the same question I asked them last year, just a few weeks after the shooting, when I visited them in Parkland at their invitation: Why talk to me? Philip offers this: "We hope there's something that we can share, you can share, that helps to advance our conversation as a country, a community of people, to make things better. 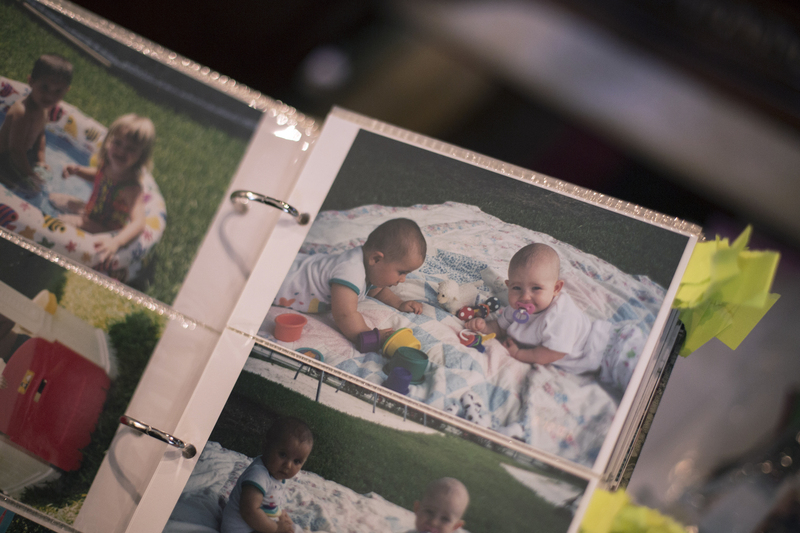 Everybody should consider what it would mean to lose their child, their spouse. And if we can do some little thing that prevents people from going through that, I think we'll consider this worth the time and effort." "It's a hard story to tell," April adds. "But ... I want people to do something. Whether it's feel, whether it's call, whether it's knock on doors, whatever it is, that they just do something. And hopefully that doing something creates a change for the positive. That's why we're doing what we're doing. ... It's definitely not easy. But it feels necessary." This Thursday, February 14, marks one year since the mass shooting at Marjory Stoneman Douglas High School in Parkland, Fla. Seventeen people were killed that day. A few weeks after the shooting, NPR's Melissa Block profiled the family of one of the Parkland victims. Her name was Carmen Schentrup. She was a senior. Now Melissa visits the family again to talk about their year of grief, anger and activism. MELISSA BLOCK, BYLINE: The days now go something like this. PHILIP SCHENTRUP: All right. Let's go. BLOCK: Dad Philip Schentrup heads to the office. On his backpack, there's a small blue pin, a tribute made by a friend. It shows Carmen's smiling face and a message. P SCHENTRUP: Be the change. Carmen Schentrup. BLOCK: Do you like having that on there? P SCHENTRUP: Absolutely. And I don't think it's ever coming off. UNIDENTIFIED PERSON #1: Come in, April. Sit wherever you want. 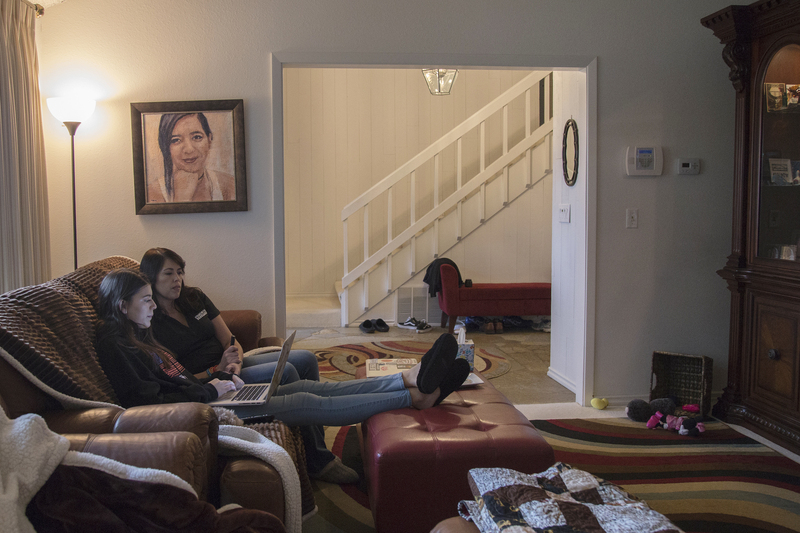 BLOCK: ...Mom April Schentrup seeks comfort at a grief support group. APRIL SCHENTRUP: That feeling, like, other people have moved on and it's hard for us to get there. UNIDENTIFIED PERSON #2: Welcome. We're excited to have you joining us today. BLOCK: Fourteen-year-old Evelyn, Carmen's younger sister, logs in for an orientation session with her new online high school. UNIDENTIFIED PERSON #2: Plan your term meaning. Find your rhythm and adjust as needed, and then thrive. BLOCK: Several months ago, the Schentrup family moved across the country, trading the palm trees of southern Florida for snowy mountain views outside Seattle. They moved mostly for Philip's job. He works for a tech company based here. But there's more to it. Evelyn, who shares her older sister's soulful eyes and glossy dark hair, tells me even though she really didn't want to move, hated leaving her Parkland friends behind, her parents needed a fresh start. EVELYN: I think it was just hard for them being, like, around so many reminders of her. BLOCK: Just needed to be away? EVELYN: Yeah. They need to be away from all the problems and the stress behind everything. BLOCK: But when Evelyn started at her new high school in Washington, she had a couple of panic attacks. That's why she's doing online classes. A SCHENTRUP: And she called me, just saying, I can't breathe. I can't. I just can't be here. BLOCK: April, the mom, can imagine what that feels like. She says at times staying in Parkland felt suffocating. The implicit pressure to be "Parkland Strong," for one thing. A SCHENTRUP: So you put on this facade that you're OK, you're strong, you're going to get through this. You're a fighter. And some days, you know, it's true. You do feel like that. And other days, it's a lot harder. BLOCK: And what made the hard days even worse was learning about all the things that went wrong leading up to the shooting. The warnings to the FBI tip line about specific threats the shooter had made. Tips that fell through the cracks. The long chain of security failures at the school and the flawed response by law enforcement once the shooting started. The more the Schentrups learned, the angrier they got. P SCHENTRUP: Lots of people knew this person was troubled. The only thing he could've done more to signal his intent was to buy a billboard on 95 and put a billboard up there. Because he was telling people all the time that he wanted to go do bad things. BLOCK: And so the Schentrups have turned to activism. They're part of the advocacy group Stand With Parkland, started by the victims' families. They're pushing for changes nationwide - tougher school safety measures, better mental health screening and tighter gun laws. P SCHENTRUP: There's a lot of people who just want to argue the extremes - gun was the issue or mental health was the issue. It isn't an either or. It's a all of the above. And so we are going to keep advocating for the reasonable middle ground that most Americans can agree on to go get things done. If we choose to wait, there will just be more parents like us. BLOCK: Their kids are involved, too. Last summer, their son Robert, who's in college, joined Evelyn on the "Road To Change" bus tour, registering new voters and talking about gun violence prevention. The Schentrups are settling into a new city, meeting new people. But April finds that the simplest questions can be the hardest to answer, like, how many kids do you have? How old are they? A SCHENTRUP: You know? You could say, Carmen's forever 16. But just when I said it, it didn't sound right. I think I even tried, I have one in college and, you know, one here with me and my other one is in heaven. But again, it just doesn't feel right. So I don't know. Still trying. I feel like if I don't mention her, it's just wrong, though. A SCHENTRUP: They'll say, Parkland, Fla., where - "March For Our Lives," or, the Parkland activists? And I say, yup. That's Parkland, Fla. But I wonder, do they know the people that died? Do they know their names? And although I'm very thankful for "March For Our Lives" 'cause they spoke when we couldn't speak and I admire them, you know, what they've done - but I also want to make sure that Carmen's not forgotten, that the people that we lost are not forgotten. BLOCK: This Thursday, one year after the shooting, the Schentrups will be at home, their new home, outside Seattle. Carmen's ashes are there in a metal urn. It's blue, her favorite color. The family has no special plans that day, just staying close. P SCHENTRUP: Bunker down, getting through the day. A SCHENTRUP: It'll never be Valentine's Day for us, I think. Every day, I cry. So I'm sure it'll involve that. And hugging Evelyn a little bit harder. But February 14, we're just going to be together. BLOCK: Melissa Block, NPR News. Transcript provided by NPR, Copyright NPR.